Far Cry 4 is another one of the many games we got to learn more about at E3. It was featured at both Ubisoft and Sony’s press conferences, which provided a hearty look at the game. 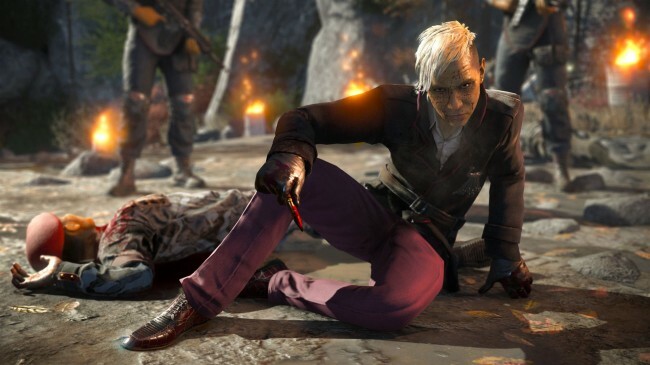 The first trailer, shown by Ubisoft, introduced us to Pagan Min, the dictator who serves as Far Cry 4’s villain. Along with that, which gives a pretty good idea of what this guy is like, Ubisoft also revealed some gameplay details. One of the most interesting is that Far Cry 4 has a co-op mode that’s even accessible to players who don’t have the game, on the PS3/PS4. If you have Far Cry 4 and are a PlayStation Plus member, you’ll receive get ten “Keys to Kryat.” You can give these keys to friends without the game to let them download an app that will let them join you in co-op mode, although their co-op time will be limited. If they then buy Far Cry 4, they can transfer over anything earned from co-op to the full game. We aren’t sure what the limitations for the invited player will be, and we don’t know if there will be any way to obtain keys for non-PS+ subscribers. Nevertheless, this is a cool idea and a great way to get more players interested in the game. Now, why not take a look at the gameplay and co-op shown off later at E3? Far Cry 4 adds a lot of new elements to the series besides co-op. For example, you can throw bait, ride elephants, and perform a melee kick attack. How does it look? Are you planning to pick it up for your Xbox One or PS4 (or Xbox 360/PS3/PC) when it launches on November 18?